On May 9, 2013, President Obama signed an Executive Order, Making Open and Machine Readable the New Default for Government Information, directing historic steps to make government-held data more accessible to the public, entrepreneurs, and others as fuel for innovation, economic growth, and government efficiency. Create a Single Agency Data Inventory. Agencies are required to catalogue their data assets, just like they would inventory computers or desk chairs, to better manage and use these resources. Publish a Public Data Listing. On their agency.gov/data pages, agencies are required to publish a list of their data assets that are public, or could be made public. Develop New Public Feedback Mechanisms. Agencies are required to set up feedback mechanisms to engage the public about where agencies should focus open data efforts, such as facilitating and prioritizing the release of datasets. Agencies are also required to identify public points of contacts for agency datasets. While there is still much more work to do, we are excited to see the great progress being made by Federal agencies to unleash the power of open data. Over a dozen agencies have launched webpages at agency.gov/data, making it easier for the public to find, understand, and use government data. Many agencies have released—and will continue to release—new datasets, which are now available both on agencies’ public data webpages and on Data.gov. Federal agencies are also working to put processes in place to manage data more strategically. In fact, over 15 agencies have launched data working groups inside their agency to improve coordination around data management, data security and protection, and data release efforts. The Department of Energy is offering a suite of new application programming interfaces (APIs) that allow software developers to access tools like a solar energy resource finder, vehicle gas mileage estimates, and autility rate database, among others. The agency recently launched the American Energy Data Challenge to identify great ideas for using energy data to solve some of America’s most pressing energy challenges. Read more here. The Department of Transportation has made more than 2,000 datasets publicly available and easily accessible. This includes data from the National Highway Traffic Safety Administration (NHTSA) that powers aSaferCar app that consumers can use to: compare NHTSA safety ratings for different vehicle models; locate child safety seat installation information; and track vehicle recalls. Read more here. The Department of Veterans Affairs recently launched its agency open data webpage, which provides users with resources to connect to, and to more easily understand and navigate, the agency’s datasets. The webpage includes tools and resources that can be used to develop web and mobile applications and design data visualizations. The agency also highlights some of the datasets that are most valuable to its users, including a nationwide list of services for Homeless Vets including health care, mental health, job assistance, education, housing, and other benefits as well as a list of all benefits, services and resources available to family caregivers of veterans, including specific forms of compensation, support networks, and legal resources. Read more here. 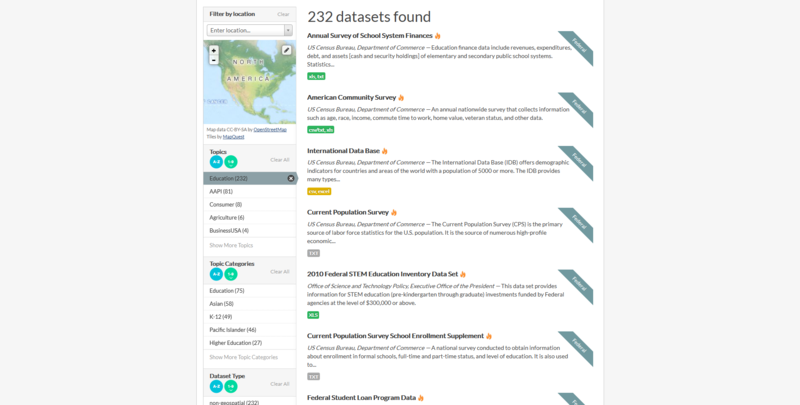 The Department of Education launched its new agency data page, “ED Data Inventory”, which includes K-12 school performance data, school demographics, and data about colleges—including enrollments, graduation rates, faculty, and student financial aid. Read more here. The Department of the Treasury continues to encourage the release of open data sets across the federal government that can help spur financial innovations and empower consumers to make informed choices about their money. For example, the agency’s new public data listing page includes an interactive tool using data released by the Bureau of Engraving and Printing on the number of notes printed each year in different denominations. The webpage also provides users new ways to learn from the agency’s aggregateIRS statistical data, which have long served to enhance market research, business planning, demographic analysis, state and local government research, and public policy analysis. On the new agency data webpage, the public can also access daily data summarizing the Treasury’s cash and debt operations, monthly statements, and more. Read more here. The United States Department of Agriculture features datasets and tools such as the USDA National Farmers Market Directory and API, visualizations and data sets in the Economic Research Service, and a dynamic API for the National Agricultural Statistics Service. The public can also now access key research information about the world’s plant gene banks as well as new satellite-powered data and mapping tools on thecondition of crops across the country. Read more here. Here at OSTP and OMB, we are also working to help agencies adopt the Administration’s Open Data Policy to unlock the potential of government data. We have made additional resources available to help Federal agencies make data open and available in machine-readable form, including guidance to agencies about how to inventory and publish their data assets, as well as free code, software tools, and case studies that any agency can use or add to, are available at the Project Open Data website. The General Services Administration, which administers Data.gov, also continues to make improvements to the website. Check out Next.data.gov—a design prototype of the next generation of Data.gov. We are eager to hear your thoughts about how to make it even better. You can provide feedback about the proposed design and functionality viaTwitter, Quora, Github, or by sending an email. Responsibly making government data open and widely reusable is good for the American people and our economy. We look forward to continuing the work ahead to increase access to our Nation’s valuable information resources, to improve government transparency and efficiency, and to fuel economic growth.